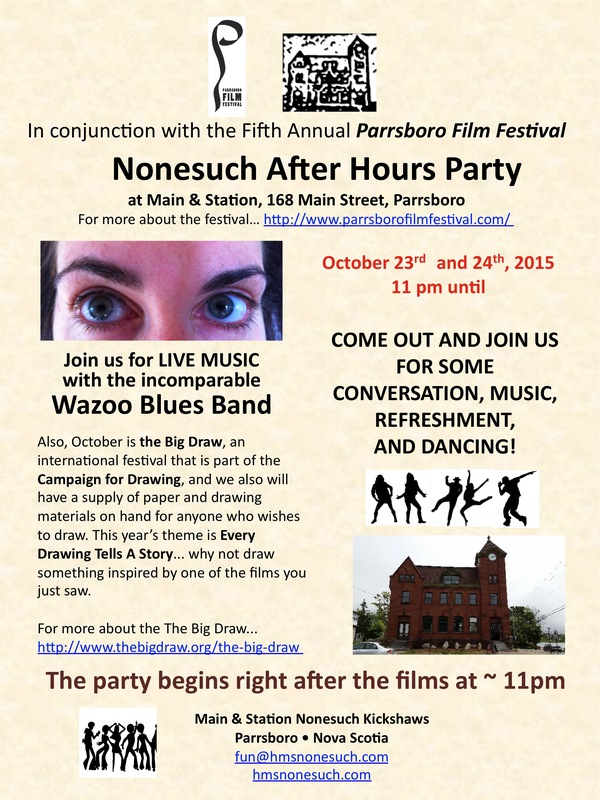 For the second year, Main & Station collaborates with PFF to host a Nonesuch After Hours portion of the festivities on both Friday and Saturday evenings from the time the screenings at The Hall finish (around 11pm) until. Last year we showed more films but this year we are mixing it up a little with some live music, dancing, and drawing. The Wazoo Blues Band will be here both nights and the floor will be cleared for dancing! Also, October is The Big Draw, an international festival that is part of the Campaign for Drawing. All over the world during the month of October there are many events that encourage drawing activities. You can learn more about the Big Draw and the Campaign for Drawing at: http://www.thebigdraw.org/the-big-draw In celebration of the Big Draw, during the After Hours events we will provide drawing materials onsite for those who wish to draw… why not sketch the band or the dancers, or, since this year’s theme is Every Drawing Tells A Story, why not draw something inspired by a film you just watched! So come on by the Nonesuch Café (in Parrsboro’s old Post Office) on Friday 23 October and Saturday 24 October beginning at 11pm and be a Night Owl for a change! This entry was posted in Art, Community, Events, Film, Music and tagged After Hours, Music, Parrsboro Film Festival, The Big Draw, Wazoo Blues Band by Admin. Bookmark the permalink.